On May 17, 2013 the Aerofuels Group reduced the price of aviation fuel by 3.9%, amounted to 1,400 rubles per ton in absolute terms. This is the second drop in prices since the beginning of the year at TZK Irkutsk. The total price reduction for the period made 6.3% or 2,323 rubles per ton. “A significant pricecut by summer travel season will allow airlines to save on jet fuel, which is one of the most important components of their costs. Savings on one 20 tons flight only make about 50,000 rubles. Provided that this oil market tendency of aviation kerosene pricecut remains, an airline that performs at least one flight from Irkutsk daily, may save about 5 million rubles for the summer period”, said Yury Popov, the Director General of TZK Aerofuels. TZK Irkutsk enters the network of 19 refueling complexes owned by the “Aerofuels Group”. It is one of the first alternative complexes in Russia, started in 2002. The refueling facility applies standards consistent with the current domestic and international norms and requirements. It also has its own laboratory to perform quality control of aviation fuel and fleet of modern aircraft fuellers. Aviation refueling operator does not have to be a part of a major oil company to offer best prices to air carriers. Aerofuels, the private operator, has proved that. For 18 years, the company has grown from one refueler at Ulan-Ude airport into a refueling service provider at more than 1,000 airports worldwide. VLADIMIR SPIRIDONOV, the Director General of Aerofuels told SERGEY STARIKOV, RBC Daily reporter about the most convenient country to work in, market prospects, and the brand new kerosene. — A few years ago I heard that foreign airlines preferred to buy Russian fuel for future use and tanker it. — The price of fuel in the Russian market is 10-15% lower as compared to Europe. Airlines are fighting for every penny trying to catch the lowest price. If Russian oil companies raise the price, then yes, airlines take more fuel in their departure points to buy less in Russia. To respond within a day, the airlines use sophisticated software to figure out if the most profitable refueling is in departure or arrival point. — Why is fuel so expensive in Europe? After all, they have no excise duty and corruption? — Historically, kerosene is more expensive in Europe than in Russia. Another 10-12 years ago, the difference was much higher. In 1999, fuel at European airports cost $300 per ton, while in Russia the price was only $100-120. That was the prime-time for Russian airlines. Another thing, our carriers flew Tu-154, Il-86, Il-62, which had poor fuel efficiency as compared to their Western counterparts. Nowadays, domestic airlines fly Boeing and Airbus, and the price difference reduced to 5-15%. However, it does not persist all the time, because sometimes crisis happen to be. In 2011 Moscow lacked kerosene, and within three days prices leapt to $200 per ton, and the price of fuel in Moscow exceeded European by $150. The Group of companies Aerofuels starts jet fuel supply of Nordwind Airlines (North Wind) flights in Ulyanovsk-Vostochny airport. The first refuelling of Ulyanovsk-Antalya flight took place on April 27th. A direct service to Turkey is offered aboard airplanes А-321. The flights are supplied with the jet fuel directly by the refuelling complex (TZK) Aerofuels Ulyanovsk. This February again TZK prolonged the full conformity certificate on kerosene acceptance and storage and aircrafts refuelling (FAR No.89) and on airport operations to support aerodrome activity in aircrafts flights provision (FAR №121) in Ulyanovsk-Vostochny airport. Besides, the laboratory of aviation fuel and lubrications quality control Conformity Certificate was prolonged, too. The Certificates were issued by the RF Federal Agency of Air Transport (FAVT) for 3 years. That is the only TZK in the region possessing aviation refuellers of 60 m3 able to offer a quick and high-quality refuelling of aircrafts AN-124 and Boeing-747 types. Fuels and lubricants warehouse is meant for storage of 10, 800 m3 of light petroleum products, being the largest refueling complex in the airport and located directly in the territory of Ulyanovsk-Vostochny. TZK own railway siding enables continuous regular supplies of light petroleum products from 20 to 30 thousand tons a month. The refuelling complex (TZK) Aerofuels Kamchatka has been successfully operating in Petropavlovsk-Kamchatsky airport for ten years already. This complex was the first in the post-soviet area to have been built “green field” to meet not only Russian but international standards as well. IATA fuel quality pool control inspection (IFQP) awarded the complex a highest status of fuel operations safety level - Green. “Our complex has been offering refuelling merely for five of ten years. It took first five years to agree upon all necessary documents, to build the complex and to struggle against monopoly as this TZK is an alternative refuelling complex in Yelizovo airport. Therefore, we can be proud that having overcome all obstacles we started working in Kamchatka so successfully to prove our competence and were able to build a positive and effective competitive market” -Vladimir Spiridonov, Aerofuels Group General Director, said. During operations at aprons TZK Aerofuels Kamchatka served 6 thousand 780 aircrafts, supplied 146 thousand tons of aviation kerosene and delivered 120 thousand tons of petroleum products by the tanker. The company manages Aerofuels Group oil loading fleet to provide fuel not only for TZK in Kamchatka and the island of Kunashir of Sakhalin area, but to supply light petroleum products to the distant northern region. Prospects of aviation fuel supply infrastructure development of Shell&Aerofuels in Pulkovo airport. Last week formal event took place dedicated to commencement of Shell&Aerofuels CJSC operation in Pulkovo airport. Managers of aviation authorities, airport, representatives of airlines and mass media gathered at the event. Refueling company became the second operator in the market of Saint-Petersburg airport aviation fuel supply. Press-conference was conducted upon completion of official part with participation of Oleg Grinchenko, head of Administration of North-Western Interregional Territorial Department of Air Transport FAVT (Federal agency of Air Transport), Sergey Emdin, General Director of Air gate of the Northern Capital LLC, Vladimir Spiridonov, General Director of Aerofuels Group and Paul Cluett, General Director of Shell&Aerofuels. Representatives of aviation authorities and airport marked positive role of Shell&Aerofuels company in the issues of competition development in aviation fuel supply market in Saint-Petersburg. Paul Cluett presented Shell&Aerofuels company to the guests and told about further operation plans in Saint-Petersburg airport. Particularly he marked that designing of aviation fuels warehouse is completed and its construction is started nowadays in the territory of Pulkovo airport. New operator of aviation fuel supply has all required certificates of Federal Air Transport Agency for operating in Saint-Petersburg airport, is regularly subject to inspections and confirms high quality of rendered services and full compliance of aircrafts refueling to ShellAviation standards. The company disposes of own new refuellers park in Pulkovo airport which meets both Russian and international requirements. Fuel refueled into aircraft tanks is subject to strict inspection in quality control laboratory of aviation fuel and lubricants. Large western air carriers are company customers in Saint-Petersburg airport nowadays. Refueling company possesses a 12-year successful working experience in Domodedovo airport. But for refueling operations performed for more than 50 foreign airlines Shell&Aerofuels are regularly assigned aviation fuel supplies in milestone events in Moscow airport: refueling of the first regular flight of Boeing 787 Dreamliner, the first flight of the largest passenger airplane in the world Airbus 380 and the first foreign low-cost airlines EasyJet. Formal opening of refueling complex of Shell&Aerofuels took place on March 27 in Pulkovo airport. The company became the second operator in the market of Saint-Petersburg airport aviation fuel supply. Shell&Aerofuels is a joint venture of Aerofuels Group and worldwide leading company in aviation fuel supply field - ShellAviation. Large-scale press conference dedicated to TZK opening in Pulkovo airport was conducted with participation of: Oleg Grinchenko, head of Administration of North-Western Interregional Territorial Department of Air Transport FAVT (Federal agency of Air Transport), Sergey Emdin, General Director of Air gate of the Northern Capital, Vladimir Spiridonov, General Director of Aerofuels Group and Paul Cluett, General Director of Shell&Aerofuels. It was marked during presentation that total annual consumption volume of Pulkovo airport is about 400 thousand tons. Share of fuelling operations performed by Shell&Aerofuels CJSC will reach from 5 to 7% of total volume by the end of 2013 and according to expert evaluations this indicator will grow. Competition in aviation fuel supply market will promote reduction of prices for fuel and improvement of quality of services rendered to airlines. The first refueling of British low-cost air carrier in Russia was carried out by the company of Aerofuels Group of companies. The first regular flight of EasyJet airlane company from Moscow to London tool place on March 18. The first refueling of a British low-cost air carrier in Russia was carried out by Shell &Aerofuels included into Aerofuels Group of companies. “It is very pleasant for us that such long-awaited in Russia and popular in Europe air carrier has chosen our joint venture with ShellAviation as partner for aviation fuel supply in Domodedovo airport. We know that British low-cost airlines lodges high demands both for rendered services quality and servicing speed in the airport”, - Vladimir Spiridonov, General Director of Aerofuels Groups commented. Federal Air Transport Agency prolongated all required conformity certificates to refueling complex Aerofuels Ulyanovsk. Refueling complex Aerofuels Ulyanovsk prolongated full conformity certificate for acceptance and storage of kerosene and refueling of aircrafts (FAR №89) and airport operations for aerodrome provision of aircrafts flights (FAR №121) in Ulyanovsk-Vostochny airport. Conformity certificate was also prolongated for laboratory implementing control over aviation fuel and lubrications quality. Certificates were issued by FAVT of the RF for 3 years. Large-scale reconstruction of refueling complex was carried out in 2012. Total investment volume constituted about 70 mln.rubles. As a result of upgrading kerosene, gasoline and diesel fuel can be stored at the base 24 hours a day with transfer capacity of around 20 thousand tons of light petroleum products monthly. Fuels and lubricants warehouse is meant for storage of 10, 800 m3 of light petroleum products being the largest refueling complex in the airport and located directly in the territory of Ulyanovsk-Vostochny. Own railway siding enables continuous regular supplies of light petroleum products from 20 to 30 thousand tons a month. This is the only TZK in the region possessing aviation refuellers of 60m3 volume capable of ensuring quick and high-quality refueling of aircrafts types AN-124 and Boeing-747. Aerofuels team is one of the winners of futsal tournament Civil Aviation Day for the third year in a row. Football team Aerofuels came third in the international futsal tournament conducted this weekend in Moscow and dedicated to 90th Anniversary of Civil aviation. Our football players win cups and medals for the third year in a row. The team has already won the Title and honors for the second and third place. Twenty four teams took part in the tournament representing the leaders of aviation field – airlines, airports and service companies. Aerofuels team reached the semifinal in tough struggle having played with the score 0:0 and yielding to Airport Vladivostok team on penalties 2:3. Playing off for the third place with S7 Engineering team our team won a confident victory with the score 4:0. “After last year’s title it was not easy to defend the right of remaining within three leaders of the tournament in which very strong teams of football players participated. We did not concede a goal in the golden series of play-off in all four matches in regulation. Only in the semifinal during the penalties the fortune took the side of our opponents” – Vladimir Spiridonov, goal keeper of the team and General Director of Aerofuels Group says. “We sincerely congratulate our friends and partners “International airport Vladivostok” with second place winning and Transaero airlines – with the title! We are sure that good tradition of futsal tournament conducting will cheer us further on, too, additionally encouraging the employees for maintaining healthful mind and enabling meeting our business partners in informal sports circumstances”, - Vladimir Spiridonov added. According to the results of 2012 refueled by the Aerofuels Group in the Russian and international airports aviation kerosene volume growth is 12% having increased up to 700 thousand tons. 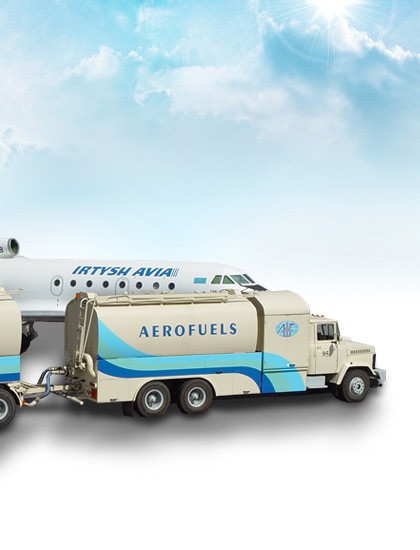 At the present time the Aerofuels Group supplies the Russian and international carriers with kerosene in 29 Russian airports and is able to arrange jet fuel supply to more than 1000 airports worldwide. Jet fuel sales volume growth is provided due to several factors including passenger flow growth, entry into perspective markets and new customers’ attraction. Many key customers of the Aerofuels Group - the Russian aviation companies have increased traffic volume in the Russian regions significantly and have extended their geographic footprint abroad. Eleven of eighteen refueling complexes being part of the group of companies network are newly created alternative TZK, and they offer aviation carriers a best combination of the offered services price and quality. In late December Joint Venture Shell and Aerofuels received a certificate of conformity allowing jet fuel supplies at the country third largest airport Pulkovo. During 2012 Aerofuels Group broadened cooperation with such aviation companies as Lufthansa, British Airways and Air France. Foreign business aviation representatives actively employed services in refueling arrangement, in particular, at such locations as Seychelles, Chile and Brazil. Last year Aerofuels potential in jet fuel supply at the airports of the Ukraine, India and China extended. During winter holidays in January a friendly hockey match “Warriors’ Brotherhood against drugs” arranged by FDCS, a charity foundation Trust and municipal authorities was held in Omsk. The Group of companies “Aerofuels” together with the aviation company Utair became Warriors’ Brotherhood team partners again. Sports festival was held to promote an anti-drug attitude, a healthy life and sport, children’s and youth proactive approach to life. Moscowites invited famous soviet hockey-players Alexander Yakushev, Sergey Makarov, Alexander Kozhevnikov and Yury Shatalov to join them in sport propaganda. The team on Omsk ice was represented by national hockey legends, the hero of Russia Nikolay Gavrilov, active officials of the FDCS central administration and even two young but, as it turned out later, very effective hockey-players - the Pegovs brothers. Veterans of the local team Avangard opposed them. Famous Alexander Yakushed opened scoring. The match was quite combative but the result was indeed a friendly score draw – 8:8. In the result the natives of Omsk got a real benefit sports festival having gathered both a young generation – sports schools students, and just a real hockey fans together at the stadium stands. The fans could watch the game and also talk to the honored sportsmen and get their autographs. The team Warriors’ Brotherhood wished everybody there not to ruin their health with addictions, not to run into drugs, alcohol and smoking problems and to lead a healthy life. Nowadays in Omsk hockey is very popular, there are two sports schools of hockey-players Fetisov and Kozhevnikov. As the festival participants said, when the icy palace had appeared, juvenile crime and devotion to drugs had decreased in that district of Omsk. Only one refueller - Sovex company has been working in the airport for a long time. As representatives of Air gate of capital of the North consortium, controlling the airport, said, now “they managed to break monopoly”. In early January Shell&Aerofuels company, quite new for Pulkovo, produced the first refuelling. Dmitry Rudenko, Air gate director on strategy and development, pointed out that the aviation company responded to the second player appearance at Pulkovo quite positively being very sensitive to jet fuel prices. Mr.Rudenko explained that fuel makes up to 30 percents of a ticket self-cost. Shell&Aerofuels appearance, Air gate representative supposes, will lower kerosene prices, “which is just happening”. In the result that shall cause a ticket self- cost reduction for passengers, summed up Dmitry Rudenko. Dmitry Rudenko marks that prices reduction, even if it happens, will be not very soon – Shell needs to take a definite share, at present it is not very significant. In a year, when a new terminal starts working, a new unified refuelling complex will start operating, too, including a depot and a hydrant system. After that number of operators must grow. Air gate director on strategy and development said that it was planned to engage 3-4 fuel suppliers for a new terminal. Negotiations are being held with all of them. At present, as Mr.Rudenko pointed out, Shell has turned out to be more flexible than other companies, though negotiations are being held with Rosneft and TNK-VR. “None of the companies could have been operating so rapidly and dynamically for such a short period but Shell”, added Mr.Rudenko.